What Is Caraway Seed Oil? Caraway essential oil is derived from the seeds of carum, or the caraway plant. The technical name for the plant is Carum carvi or Apium carvi. The plant is a member of the family Umbelliferae, which features plants such as fennel, cumin, dill, and anise. The biennial herb, which is indigenous to Asia Minor, is now grown throughout Russia, Northern Europe, and Africa. The caraway plan is identified by furrowed yet smooth stems that grow about two feet high. The leaves are fern-like and soft and the plant displays pink flowers in June. The seeds of the caraway plant are considered fruits and look curved and compressed. They exhibit a translucent, horny look and show five noticeable yet pale ridges. When these ridges are bruised, they release an odor that is pleasant and distinct. 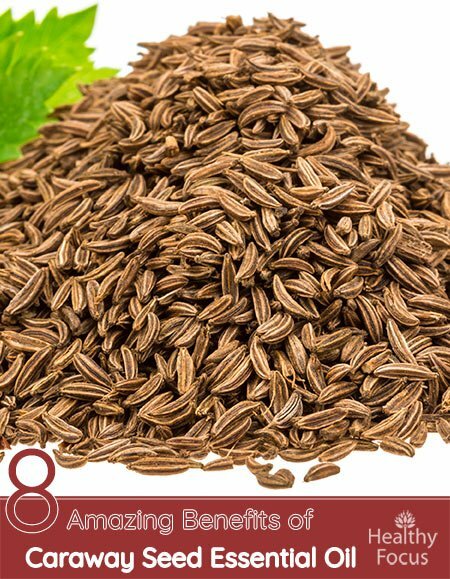 Besides caraway essential oil, the plant also produces a spice that is used in India and Europe. This spice has been used since the Stone Age. The ancient Egyptians used the spice to flavor foods while the ancient Romans used the spice when making bread. During the Middle Ages, both the Austrians and Germans used the spice in cooking. The oil that is extracted from the caraway plant’s seed smells a bit peppery and also conveys a spicy, sweet scent. The medicinal properties of caraway essential oil come from a number of components, primarily carvone, aldehyde, acetaldehyde, cumuninic, and limonene. The concentration of these components is dependent on the seed’s or fruit’s ripeness when it is harvested for use. For instance, the level of carvone increases as the fruit continues to ripen. When the oil is derived from fully ripened or mature seeds, it contains more of the component carvone and less limonene. This outcome results in a premium-quality oil. If you want to make sure that you are using a quality oil, you should check on the harvesting methods used by a company. You can also make your own oil to ensure that you receive a quality oil. You can do this by crushing and distilling the plant’s seeds when they are fully ripe. The seeds are dried first before they are crushed and the oil is distilled through steam distillation. Each caraway seed produces about 2% to 8% of caraway essential oil. The oxygenated compounds in the oil are enhanced as well when the caraway seeds ripen. Harvesting the seeds too soon can hamper the overall effects of the oil. Harvesters who show patience in harvesting, distilling, and extracting the oil produce a better-quality and more efficacious product. One of the most common uses of caraway seed essential oil is to boost digestive health. This oil can be used as a natural remedy for stomach upset, bloating and indigestion while it may also help boost a person’s appetite. The oil includes an agent, cisapride, that is helpful in treating heartburn. A study published in 1999 in one German medical journal also listed the oil as being helpful for treating stomach upset. To treat an upset stomach, try massaging some of the diluted oil into your stomach area. Inhaling the oil either through a diffuser or directly can also help boost digestive health. Is there anything more important than a healthy heart? Fortunately, caraway essential oil may help maintain your heart’s health and naturally help reduce many of the risk factors associated with heart disease like high blood pressure and high cholesterol levels. Caraway essential oil strengthens the cardiac muscles and assists in regulating the heart rate. The oil is also said to prevent hardening the arteries and veins and keeping the blood pressure in check. Caraway seed essential oil may also help reduce high cholesterol levels which is another risk factor in heart attack and heart disease. Caraway essential oil also has effective, natural expectorant properties that may prove very beneficial for treating a range of respiratory conditions including coughs, colds, bronchitis and sinus congestion. Natural expectorants like caraway seed oil help thin out the excess mucus and phlegm that builds up in the respiratory tract and nasal passages. By thinning out this build up of phlegm and mucus, you can expel it more easily and in turn you will be able to breathe more freely. Caraway oil also has excellent, anti-inflammatory properties that can provide you with natural relief from inflammation int the respiratory tract including the nasal passages, throat and bronchi. The best way to treat a cough or cold or other type of congestion is to inhale the oil. You can inhale caraway seed essential oil directly from the bottle or from the palms of your hands. However he best way to deal with the condition is to make your own steam treatment. Add a few drops of caraway seed essential oil to a sink full of hot water, cover your head and shoulders with a towel and lean over the water. inhale the rich, healing vapors for a few minutes or for as long as you can tolerate the heat. Caraway essential oil has been proven to treat infections of the respiratory system, digestive tract, colon, and excretory and urinary systems. You can also the oil to treat external infections as well and to stop the growth of fungi and bacteria. Caraway essential oil can be used as well to help anyone suffering from problems with urination. The oil has natural diuretic properties and is also used to remove uric acid and to clean accumulated waste from the kidney. By helping you get rid of excess water and flush the system of toxins, caraway essential oil can naturally help treat UTIs, kidney infection and even gout. Moreover, the oil helps reduce fat and improves blood pressure because it stimulates urine flow. Add the oil to your shampoo if you are suffering from an oily scalp or if dandruff or dryness is a complaint. The oil can also help relieve skin problems such as pimples or similar outbreaks. Try adding a few drops of caraway seed essential oil toy your regular skin care product or mixing it with water and applying it to with a q-tip to treat acne. Caraway seed essential oil has a warming and stimulating effect on both the body and the mind. many people find that inhaling this wonderful oil can have a powerful effect on fatigue and mild case of depression. In aromatherapy, the oil is also used to relieve stress and calm the body and mind. Try diffusing the oil at home through the day and throughout the night to give yourself a much needed emotional boost. This oil is best used when it is diffused, applied topically, or inhaled. For example, you can diffuse the oil in a vaporizer or use an aromatherapy burner. Add a couple drops to soothe digestive complaints, boost respiratory health, and relieve nerve discomfort and pain. You can also blend the oil with a carrier oil that will not irritate the skin. Suggested carrier oils include coconut oil, olive oil, jojoba oil, or sweet almond oil. Add the blended oil to your bath water to calm the nerves. If you have a skin or scalp condition, you might also try adding the oil to a lotion, shampoo, or cream. You only need to add a couple drops of the oil for the needed relief. What is Caraway essential oil used for? Caraways seed essential oil has a surprisingly broad range of potential health benefits. It is typically used to treat digestive complaints and studies suggest that it is an effective remedy for inflammatory conditions like IBD and colitis. It is also used to treat respiratory problems, boost the heart’s health and for treating infection. Not only does caraway seed oil help treat a range of internal conditions but it can also give you an emotional boost and can be used to treat the skin and the hair. Is Caraway the same as fennel? Caraway is often confused with fennel and although they are related they are actually different plants. The flavor of fennel is also more similar to licorice or anise while caraway has a very different type of flavor. They are very similar in appearance and other similar herbs include dill, cumin and anise. Is Caraway safe during pregnancy? Caraway oil should not be used during pregnancy or while breast feeding. There is no data regarding its safety and it is best to err on the side of caution and avoid using it. While it is likely safe to inhale the oil, it should never be consumed. This popular essential oil is usually safe for most people to use. However, doctors do not recommend its use for pregnant women. That is because using the oil can trigger menstruation and cause a woman to miscarry. While the oil is said to help in secreting breast milk, it is still important to check with a doctor first before using the oil for this purpose. Caraway essential oil may cause certain side effects such as rashes, itching, or similar skin irritations. This normally occurs in sensitive people when the oil is used in high concentrations. That is why you should always dilute the oil with a carrier oil before you apply it to the skin. Be careful, too, about blending the oil with peppermint essential oil as doing so can lead to nausea or heartburn. The main reasons for using caraway essential oil are to improve urinary health and to lower blood pressure and prevent heart ailments such as heart disease. Because the oil is known to prevent hardening of the arteries and veins, it is the ideal oil to use for anyone who has known problems with heart ailments in his or her family. Use the oil to keep your heart’s rhythm regulated and to strengthen the heart muscle. The oil generally is not ingested but is usually used in a diffuser or blended with another oil and applied topically. When applying the oil topically to an external infection, make sure that it is properly diluted. It can also be used to fight digestive upset. The soothing properties of the oil calm the nerves, which relieves the stress of an upset stomach. Many people add the oil to a commercial cream, lotion, or shampoo to take care of scalp or skin problems or irritations. Caraway seed essential oil is considered a safe oil for most people. Pregnant women should not use the oil and lactating women should check with their doctors before proceeding with use. Check with your doctor about your intended use for the oil to play it safe. It is also helpful to talk to an alternative health practitioner or an aromatherapy professional about how to blend the oil for use. To make sure that the oil is used safely, you should always blend it with a safe carrier oil such as coconut oil, almond oil, or jojoba oil. Most users blend the oil with coconut oil as this oil is considered a popular and safe carrier product. To ensure the oil’s potency, always buy the product in an amber glass bottle. The oil is packaged in differently sized bottles. If you choose a smaller sized bottle, it usually comes with a dropper to make measuring and blending easier. Store the bottle in a cool, temperate area of the house away from sunlight to lengthen its shelf life. The oil should never be applied full strength to the skin as it can lead to a severe rash or irritation. Blend caraway essential oil with compatible essential oils such as ginger, orange, lavender, coriander, and frankincense. Doing so will make the oil more effective and safe. This oil is one of the few essential oil products that is produced in Europe. Steam distillation is always used when the oil is extracted from ripened seeds. The riper the seeds, the better quality the oil. Check out the manufacturer’s processing procedures when you are making a selection online. Quality oil is always harvested from fully ripened fruit or seeds. You can also grow the plant yourself and crush and distill the oil. Dry the seeds first before they are processed and distilled. The benefits of using the oil are primarily limited to the digestive, urinary, excretory, respiratory, and cardiac systems. For anyone concerned with his or her heart health, this is the oil to use. If you want to possess a better-functioning and healthy heart, you need to include this oil in a preventative plan of care. When making a choice for caraway seed oil, you need to review the benefits and learn more about what oils go best in blends with this oil. If you have a certain health condition, such as a heart condition or a urinary tract infection, you will find that this oil is a therapeutic and reliable remedy.